The Committee's Challenge was "Tessellation Quilt"
Grania was the only one who brought something for this month's challenge. Val with her Celtic Alphabet from a workshop. 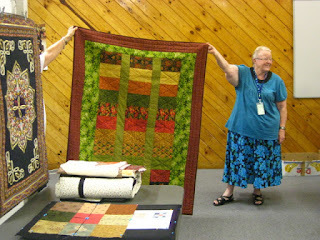 Glenda showed the completed BOM from 2012. And general Show and Tell. Judy with her black and white quilt and pillow shams. Brenda showing the quilt she made for a wedding present that is now on its way to Australia. Another community quilt from Pat. Jules displaying Dragica's last 2 12x12 challenges. This month's speaker was Billie Harbidge from wearable arts. from the meeting in my absence.